The cash-strapped Mets are in talks to sell a minority stake in the team to hedge fund manager David Einhorn for $200 million. Normally, minority shareholders aren't news, but these Mets aren't in a normal situation. With more than a billion dollars at stake in the Bernie Madoff lawsuit, the team hemorrhaging money to the tune of $70 million this year, and already in debt to MLB, it's not unforeseeable that Fred Wilpon and Saul Katz need to sell the whole damn team just to remain personally solvent. And it's not unlikely that David Einhorn would be there waiting to buy everything. If you like your sports owners to be, for better or worse, "interesting," Einhorn's not bad. As Hardball Talk points out, he might be familiar to most casual sports fans as the rich guy who entered the 2006 World Series of Poker, and did pretty well for himself. He finished 18th in the 8,773-player tournament, taking home $660,000 and promptly donating it all to charity, as he had promised beforehand. He's known as outspoken on Wall Street, publicly announcing his intentions to short sell other companies. He's powerful enough that his words alone caused those companies' stocks to take a major hit, and it got him investigated by the SEC for market manipulation. But more often than not he's been right: he was one of the first to see Lehman Brothers' accounting problems. And lest you think he'll calm down once he owns the Mets, just yesterday he called for Steve Ballmer to step down as CEO of Microsoft. He is, or at least was, a Mets fan. In an interview with the Wall Street Journal last year, he was asked about his baseball allegiances. DJ: You grew up first in New Jersey and then in the Milwaukee area after your family moved. So, Yankees or Brewers? Einhorn: Brewers! In New Jersey we were actually Mets fans. 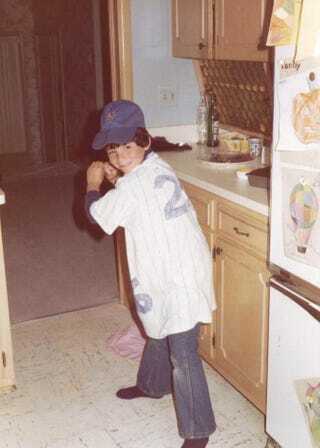 Here's a rare known fact: I was [Former Mets slugger] Dave Kingman for Halloween one year, as a five- or six-year-old (photo via Dealbreaker). Between the Mets and Brewers, still Brewers, with a little soft spot for the Mets. But nothing for the Yankees. There's a fascinating debate to be held over the merits of having a fan for an owner. On one hand, they're likely to meddle in personnel decisions, overruling baseball people. That's what happened in the Bronx for so long. On the other hand, a hands-off owner who's just in it to make money can let a lot of terrible team decisions slide as long as they don't affect his bottom line. That's what's happening in Pittsburgh right now. Whatever happens, it is some kind of poetic justice that their shady Wall Street dealings could force Mets owner to lose their team to someone who's made his fortune calling out those same shady dealers.